As we’re done with Christmas and entering into the new year, for us Aussies we’re moving into the hottest and most exciting months of the year. Summertime is a chance to get outside, have fun, see friends and family and generally pack in as many activities as possible. One thing that’s always worth doing is hosting some parties at home, backyard barbeques, afternoon tea parties and picnic style lunches aren’t too expensive and are a great way to get everyone together. 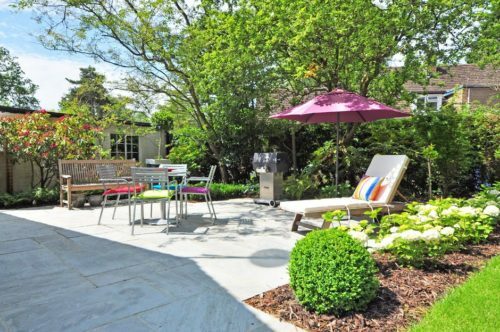 But to throw get togethers in the garden you of course want to make sure it’s in the best condition possible. Here are some of the ways you can go about it! If you’ve neglected your garden over Christmas, chances are it’s looking a little untidy. Removing things like bicycles and tools strewn around, tidying up kids outdoor toys and putting away things like gardening boots and fallen pots will instantly make it look neater. You will need to pull up weeds, prune down bushes that have grown large and deadhead any plants that have started to die off. Using a jet washer you could clean down walls and paths. Things like removing twigs from roofs and gutters will not only make everything look tidier and allow rainwater to drain better but you also help to prevent bushfires by removing potential fuel. It’s important to prepare for the bushfire season, this is a huge threat to our homes as Australians so something to bear in mind. Other general maintenance jobs include checking outdoor taps to make sure the plumbing is ok and making sure tools and appliances like strimmers and lawn mowers are in full working order. For most of us, the lawn is one of the most important features in the garden. It takes up the most space and helps to keep the garden looking alive and give it colour all through the year. But over the winter months, lawns can become flooded and parts can die off. If you have pets you might notice urine burn spots. Now we’re into the summer, grass will grow very well providing you keep it watered, so purchase some grass seed and sprinkle it down, both on the bald spots as well as throughout the rest of the grass. This will fill in sparse patches and generally thicken it up, and in a few weeks you’ll have a much healthier lawn. Use a hose to water the grass morning and evening, avoid during the middle part of the day when the sun is hottest to prevent it from burning. 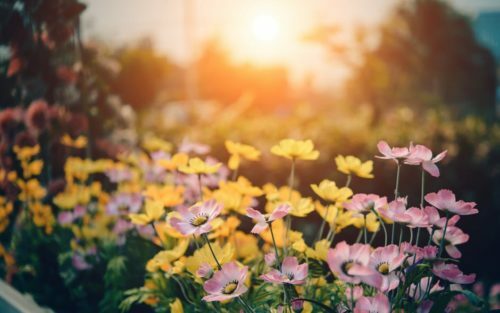 Finally, fill your pots, flower beds and borders with beautiful flowers to make the garden look pretty and well cared for. If you plant bulbs and seeds that flower at different times of the year, once one lot is dying off another lot will be coming through. Simply deadhead the blooms that have finished flowering and you get a spectacular colourful display all through the year, every single year.